Join us for this fun and easy, step-by-step class, suited for any level – whether you’ve never painted before, or you’ve dabbled a bit, or all the way to intermediate students who want to add some valuable new skills to your toolbox– all are welcome. If you have wanted to paint with oils or acrylics didn’t know where to start, then this class is for you! 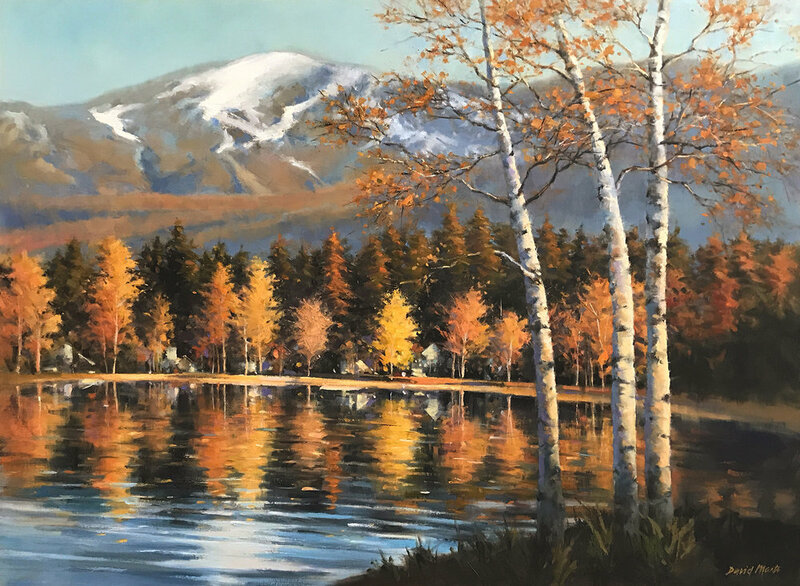 With demos and individual guidance, David will teach you how to paint magnificent mountains with their craggy and snowy peaks, and majestic trees reflected in alpine lakes. Getting the snow right, with just the right amount of impressionistic technique to look like snow but not photo-realistic; adding shadows and highlights to capture the mountain light; how to add reflections to those gorgeous alpine lakes – these will be some of the new skills you’ll learn. All in an encouraging, fun and inspiring workshop with one of our region’s favorite artist-instructors. David will teach a simplified approach. You will learn to break down the scene into basic shapes, values and colors. He will begin demonstrating a painting and then have you follow along with his guidance in a step-by-step approach. We will use a fairly limited palette and go over the basics of color mixing. David will provide photo reference material but you may bring your own as well. The class will be a combination of demonstrations and personal instruction to help you gain confidence as you work on your own paintings. David will be painting in oils but students may work in either oils or acrylics. Acrylic artists are encouraged to use retarding medium and/or mix in open acrylics to extend drying time. For intermediate and beginning or inexperienced painters. Don’t be intimidated or put it off any longer! This will be fun and encouraging class. Note for Oil Painters – As an alternative to purchasing individual paints, you can purchase an oil paint set instead, such as the Georgian Oil Color 10 tube Introduction Set by Daler-Rowney (or equivalent). Students new to oil painting will find that this introductory set contains the appropriate colors necessary to begin experimenting. The set contains ten tubes of 22ml Georgian oil colors including burnt sienna, cadmium red hue, cadmium yellow hue, crimson alizarin, French ultramarine blue, lamp black, lemon yellow, sap green, titanium white and yellow ochre. Bring 2-3 canvas panels or stretched canvas ranging from 8x10” to 12x16”. Reference photo if you would like to use your own. Dave will also provide photos. Acrylic painters: bring a spray water bottle and an extender to slow the paint drying time. Don’t forget something to bring your paintings home in!